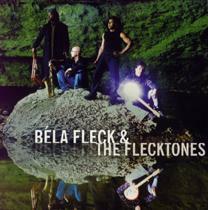 George Graham Reviews Béla Fleck & the Flecktones' "The Hidden Land"
The world is full of novel musical performers and groups who make their mark with something unusual, either stylistically or in instrumentation. But novelty acts like that tend not to last very long. One group that started out with very unconventional instrumentation and has lasted for a remarkably long time is Béla Fleck and the Flecktones, whose new CD is called The Hidden Land. Ever since Béla Fleck picked up the banjo at age 15, he has been something of a trailblazer. A graduate of the High School of the Performing Arts in New York, the school celebrated in the movie Fame, Fleck has never been one to let the conventions of the banjo stand in his way. He quickly developed a reputation as a bluegrass virtuoso while still in his teens, but his musical background was always very wide-ranging. On his first solo album recorded when he was barely 21, he included a composition by jazz-rock fusion great Chick Corea, served up in bluegrass style, and in the more than 25 years since then, he has been making his mark not only as a banjo player who goes where virtually no banjo player had gone before, but also has become an outstanding composer of music that did not necessarily have to be played on a banjo. After spending the better part of a decade with the popular and eclectic bluegrass band New Grass Revival, in 1990, Fleck encountered the Wooten brothers: Victor, a virtuosic electric bass player who said his style was influenced by Fleck's banjo technique, and Victor's older brother Roy "Future Man" Wooten who joined the band playing drums and percussion through a synthesizer connected to a guitar controller, something he calls the Synthaxe Drumitar. The original personnel also featured Chicago harmonica man Howard Levy, who also played keyboards. The sound was highly original to start out, and the band's style continued to evolve, as a trio, after the departure of Levy, and then back to a quartet with the addition of Nashville sax man Jeff Coffin. In the meantime, Fleck continued to do various side projects, including some straight bluegrass, and an album of classical pieces transcribed for banjo. One of the most impressive things about Fleck is that although his trademark instrument is the banjo, and his playing style is dictated by the instrument's lack of sustain, that has not stopped him from pursuing musical influences that take him far from bluegrass, and creating music that is as broad in influence, that just happens to be played on the banjo. After a very wide-ranging three-disc album almost two years ago, Fleck and his colleagues create very much a band album with a reasonably consistent sound this time around. With the group performing in various jam band festivals, that influence is felt on this CD, with more extended pieces, and most of the album's tracks segueing from one into the next without a break, in jam style. But this is not to say the Flecktones have become like many jam bands who noodle away with a minimum of thematic material. The Hidden Land, though more jam oriented than some previous albums, nevertheless is full of the musical ideas and infectious riffs that may leave you remembering the tunes even though there are no lyrics. Though previous Flecktones CDs, especially the live ones, have had various special guests, The Hidden Land is very much a self-contained recording, with just the quartet making all the sounds. Fleck plays various antique acoustic and contemporary electric banjos and some guitar for a rather wide palette of sounds. What is distinctive about this recording is that Future Man plays a lot of conventional acoustic drums, in addition to his trademark Synthaxe Drumitar, and that often gives the recording a jazzier quality. Béla Fleck and the Flecktones' new CD The Hidden Land is not the band's most ambitious project, nor is it their most innovative. But it's a great collection of music by a remarkably original band whose three founding members have been together for 16 years now. Fleck remains as eclectic as ever, and one again he has created worthwhile music that could be as interesting even if were not played on the banjo. The band's sound remains very distinctive, and Roy "Future Man" Wooten's use of acoustic drums gives the this recording a slightly more conventionally jazzy sound in spots. As always, the playing is very impressive, and each of the members gets to demonstrate his respective versatility, with Fleck on various electric and acoustic banjos and some guitar, Victor Wooten always being inventive in his bass playing, and Jeff Coffin using a lot of different wind instruments, from sax to flute to whistle, as well as playing some keyboards. Our grade for sound quality is a solid "A." Fleck has always held a high standard for the sonic presentation of his music, and this CD is no exception, with a first-rate mix, generally impressive clarity, and a commendable dynamic range. Who would have thought that a band led by a banjo player, with a guy who plays drums from a guitar-like instrument, would last? Béla Fleck and the Flecktones have not only lasted but remained both critical favorites and remarkably popular in a time when many other bands have come and gone. They have done it the old-fashioned way, though a combination of resourcefulness, originality and undeniably superb musicianship. The new CD The Hidden Land is a worthy addition to their collection.